We are located in Asheville, North Carolina in the Blue Ridge Mountains, an area considered to be one of the most beautiful regions in America. You've probably heard of Asheville 's reputation. We're proud to have been named "All-American City". Asheville consistently ranks high in national quality-of-life polls in categories like "livability" and "healthiest places to live". And for years we've been called the "Land of the Sky." 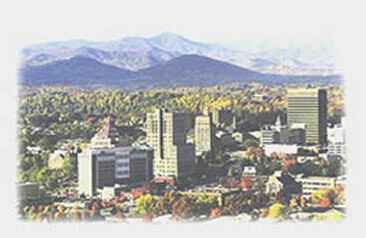 For those of us who live here, our favorite name for Asheville is home. For Directions from one of these airports - copy and paste address in Google link below.